Ovid and his influence are studied in classrooms as various as his poetry, and this Approaches volume aims to help instructors in those diverse teaching environments. Part 1, “Materials,” is fittingly collaborative and features brief overviews designed to give nonspecialists background on the more challenging aspects of teaching Ovid. Contributors examine his life and legacy, religion, and relation to the visual arts as well as his afterlife in the Latin classroom, in various translations, and in the Ovide moralisé. The editors detail the contexts in which Ovid is taught, identify trends in teaching his work and the Ovidian tradition, and recommend editions and resources for classroom use. The introduction to part 2, “Approaches,” considers Ovid’s relation to Vergil and the development of Ovid’s influence and reception, from the medieval and early modern period to the reinvigoration of Ovid studies in the twentieth century. 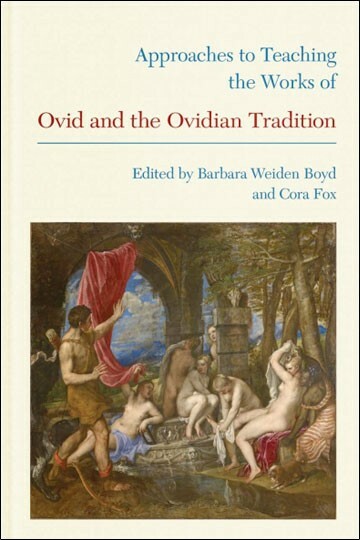 In the four sections that follow, contributors provide practical ideas for classroom instruction, examine the political and moral discourses shaping Ovid and his legacy, explore how gender and the body are represented in Ovid and the Ovidian tradition, and look at various ways Ovid’s works have been used and transformed by writers as diverse as Dante, Cervantes, and Ransmayr.